The legendary dancer, Anarkali has undoubtedly created her own line and still, young girls and women admire her charm a lot. The type of suits worn by the dancer has won millions of hearts of royal and common people as well. 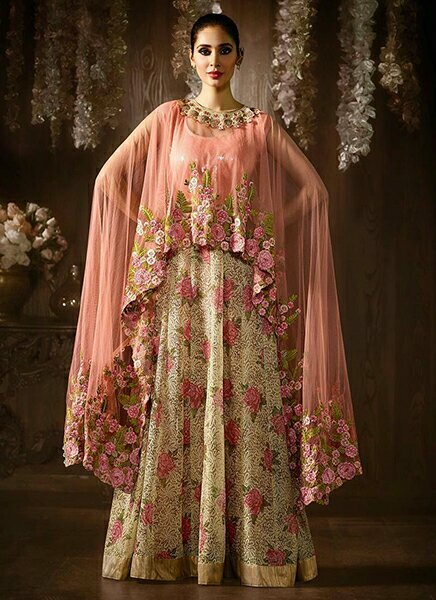 People who are glued to their roots love to wear Anarkali salwar kameez and undoubtedly, the variety of these suits make the woman look beautiful in any way. The Anarkali suits boast its heavy and magnificent works and designs that are surely steal-worthy for every fashion pro woman. They are very endeared to every woman just because they can be worn as long gowns as well. Be it your BFFs wedding ceremonies or any housewarming occasions, you can select various types of Anarkali suits according to your choice. It is a type of ethnic wear for women which have come directly from the fashion mines of Pakistani designer wears. They showcase a rich combination of colours, cultural weaves, contemporary designs and seasonal hues as well. Embrace every age, shape and complexion of women, this is one Indian suit that you need to own right now! Take a bold leap with jacket style Anarkali suits. These Anarkalis come with beautiful jackets which are either pre-stitched or can be worn while giving a finishing touch. Jacket Anarkali suits are available in short, medium and long jackets which give various options to the fashionistas. You can explore embroidered jackets, velvet slit jackets, denim jackets or shrugs, Dori style Jaipuri jackets and many more. Steal this style right now because you definitely don’t want to miss out. This wedding season, embrace the gorgeous look of cape style Anarkali that can definitely transform you into a princess in no time. Try from the cape style Anarkali collection and choose a warm or bright or different shade of coral colours. Be the bombshell of your town by adoring this cape look because not every princess has a long trail of the cape; some has short like this. Accentuate your beautiful looks with pearl jewellery and pumps to complete your look. The designer world is the most startling and confusion one. Check out layered Anarkali suits from the collection which comes under the ravishing range of every woman. With several layers or tiers to complete one complete length till calf or ankle, these layered Anarkali salwar kameez sets come with awesome bounce effect. Include this in your wedding trousseau as well and don’t forget to wear them with royal polki earrings. As the name suggests, these floor length Anarkali suits showcase long sleeve blouse designs and reach till ankle and sometimes floor. Feel the regal attitude in you by wearing this ecstatic range of Anarkalis. Floor length Anarkalis are also embraced by many Bollywood top actresses because they are also a status statement maker. They feature long torso and full bottom length which make possible for the craftsmen to showcase their talent in broad designs and art such as long embroidery, prints, thread work or patchwork and etc. I didn’t know that there were different types of anarkali suits. Previous Previous post: This wedding season, go shopping the Charm board way!